Concept #4 is another partial mushroom design. It attempt to fix some of the short comings of Concept #3. Again, the focus is on the SRRR (Farmington to Phillips) and the F&M (Strong to Bigelow). It reflects that modeling the P&R (Phillips to Rangeley) is not that important to me. 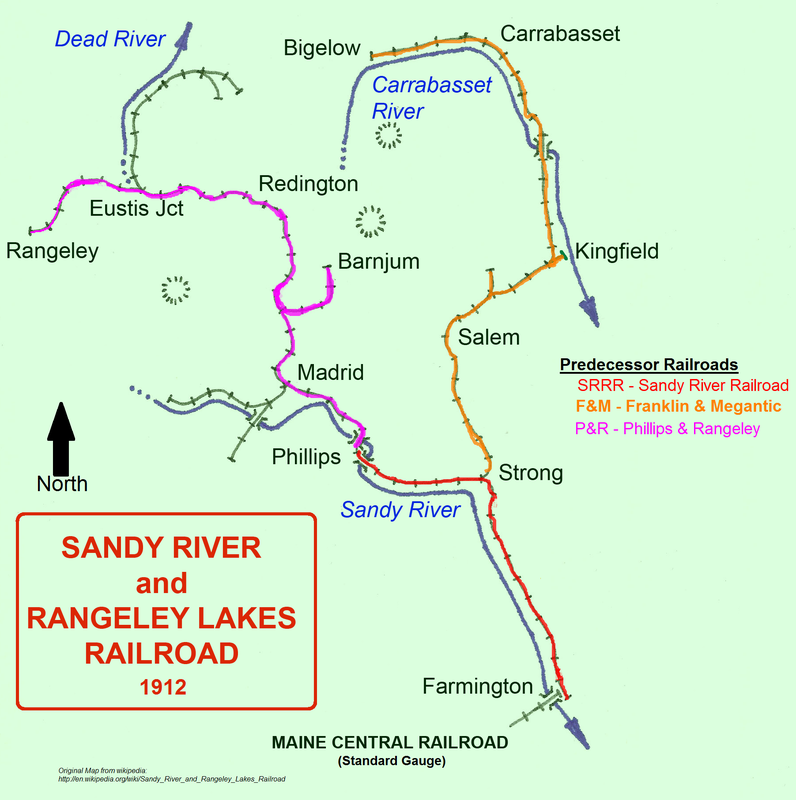 Like Concept #3, Bigelow and Carrabassett on the F&M are mushroomed above Mapplewood and Farmington of the SRRR. Bigelow is viewed from the inside of the peninsula and Farmington is viewed from the outside. The emphasis of the layout is on the SRRR (Farmington to Phillips) and the F&M (Strong to Bigelow). Both are well represented with the SRRR being 140′ (vs. 121′ of Concept #3) and the F&M being 109′ (vs. 98′ in Concept #3) in length. The P&R (Phillips to Rangeley) is represented by Rangeley staging below Starbirds. This concept has 6+ feet for the Bigelow sawmill, much better than the 4 feet of Concept #3. Farmington has ample length for all three yard areas, but the upper yard would be curved under Carrabassett. Strong has it’s natural curve to the left (going north from Farmington) and Phillips has its prototype curve to the right (going north from Strong). However, Phillips is scrunched and aisle way is tight. Kingfield, as the hub of the F&M has potential but still remains tight. Might require flipping and have the main go behind the station area. Salem on the F&M has been removed and the logging between Kingfield and Bigelow becomes an emphasis of the layout. The long mushroom peninsula present impedes access to the room. For this reason, I’ve tried to keep the nod-under. It makes fast access to the workbench/sink area. A cool feature of the layout is the nod-under. The track elevation would be 57″ or so, so a 55″ clearance could be had to enter the room. At roughly 52″ around Kingfield/Starbirds there is sufficient clearance to clear the sink and workbench. Bigelow (62″) the highest point and Starbirds (52″) share the same aisle. Thus any platform at that location should be very low. I’m also cautious to adding a platform there, as it is the access to the sink and workbench. Most likely step ups would be provided for Bigelow and possibly Carrabassett. Phase 2: Free-mo Farmington (Station and middle yard) Placed at Strong, add Starbirds. Phase 4: Correct Strong, build Phillips Peninsula, and add Rangeley Staging. These phases seem very reasonable, Truly a railroad that grows and grows no bigger than desired at any phase. The layout would be operational at each phase of construction. However, the phases take up much of the room. Other concepts leave more real estate in the room through the first 2-3 phases.